Extreme Modern Makeover hits Charlotte's West Side Lewis Forest neighborhood. And, darn it they forgot to bring the cameras! What a transformation 5400 Pinebrook has undergone in the last year. Too bad reality tv wasn't there to document it. Green City Development has taken this "Mid-Century Modest" Atomic ranch, blown it up and out and turned it into a hip modern example of urban style. 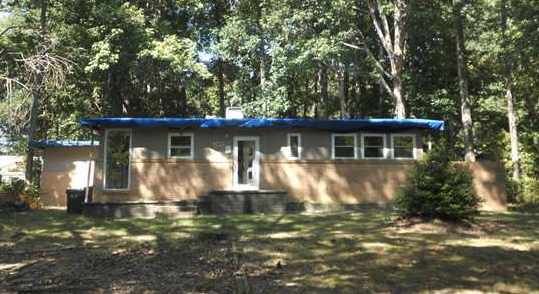 When 5 Points Realty agent Edwin Wilson found this little foreclosure he had some real vision. Located on a quiet street just 5 miles from uptown he knew that buyers would feel comfortable in this "sleepy" old school neighborhood. But he must have been able to do some real "selling" to convince the team at Green City that under the ugly blue plastic tarp a modern jewel could emerge. The original front can still be seen but with new paint, landscaping, siding and windows now it invites you in. The original three light door is painted pop art yellow. Inside walls were taken down new flooring and banks of windows added and "voila" you have wide open spaces. The kitchen has custom cabinets (I'm talking nice solid wood) with chrome accents and high end appliances. The Silestone counterop sets off the contemporary glass tile backsplash. Ash stained floating wood floors stretch across the huge living space to the bio-ethanol fuel fireplace which is surrounded with custom tile. The wall of windows expands the living space out to a private perfectly modern patio with firepit and retaining wall. expense with the 12 x 24 tile, pebble shower floor and beautiful chrome fixtures. A pane of floor to ceiling glass creates a huge walk thru shower. It is so spectacular you'll be inviting all your friends over to see it. Speaking of having friends over... The back patio is the perfect place for a party. An expanse of windows from the living room brings the out doors in. The clever builders carried the tone of the floor to the outside in large 4 x 4 concrete patio squares. There is a retaining wall defining the space and a fire pit too. 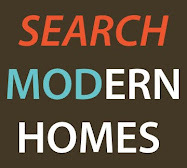 Edwin Wilson and Green City Development have done a fantastic job proving that Modern can be affordable and fantastic! You can see the old house...if you squint. Soft grey tile set on a brick pattern add a contemporary edge. Modern details make a splash. The master bedroom has screaming high ceilings + clerestory windows. Concrete squares and a fire create a modern patio. Original three light front door and modern accents. If you'd like to take a tour of this new modern home in Charlotte, NC give Savvy + Co. Real Estate a call at 704-330-8326. 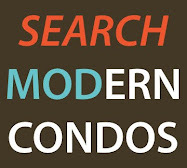 We specialize in Modern and Contemporary homes for sale... we know where to find them and can represent you in your purchase. What a transformation! Edwin and Brandon Brown certainly worked their magic on that property. I love it! CMC - they sure did. It is a wonderful house... and so bright! The house remodeling in charlotte nc was a huge success from the look of things. Using glass windows sure did make the light get through the house,and the bathroom. The house is beautiful.